I am at a loss as to what to talk about today. It is cold here this morning and my cats are stuck to me like glue trying to absorb some heat. Yes I keep my house colder than most. I grew up that way. My parents kept the heat on a very low temperature then ran kerosene heaters to keep the cost of heating oil down. I don't have heating oil, but I don't like a hot house. My thermometer is set for 66F. I have blankets if I get cold, or I put on a sweat shirt, but usually that's the temperature where I'm comfortable. Of course, this causes issues at work, because people crank the heat up to 80F and I sweat and complain all day long! I do have a fan at my desk, and my coworkers and I have compromised at 72F and they just bring a sweater to work. I sit there in a Tshirt and sweat! It's hilarious. We laugh about it all the time. How cold they are and how hot I am. It's funny to me, I guess maybe you have to be there. 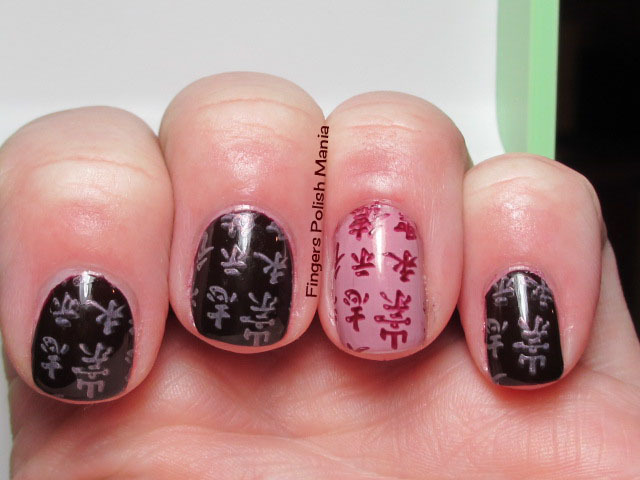 On another tangent, I love Chinese letters. I wish I could read and write it, but am way too lazy. 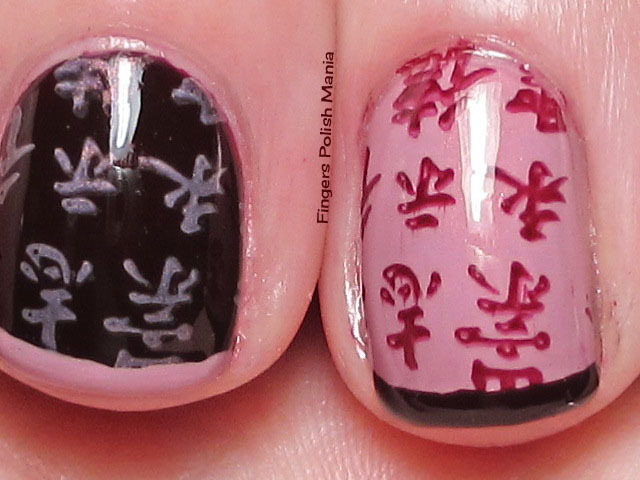 I think about back in the day where Chinese Medicine Men would write with big paint brushes all those intricate letters. I also have a thing for Egyptian Hieroglyphics. I did buy a book on how to read that-but it's in a big pile with all my other books to read! Why am I babbling about this? You'll see. You know there's always a method to my madness. This is Jessica Crimson Tattoo and Rescue Beauty Lounge Poco a Poco. In back is my new DRK-C plate! I started with Crimson Tattoo and an accent of Poco and guess what? Stupid me forgot to take pictures of that step until I was getting ready to stamp my accent nails! So here is Crimson Tattoo, which is a gorgeous deep burgundy cream stamped with Poco, which is a dusty mauve with hidden shimmer. I used my new DRK-C plate. I was so mad at myself for skipping the first step! 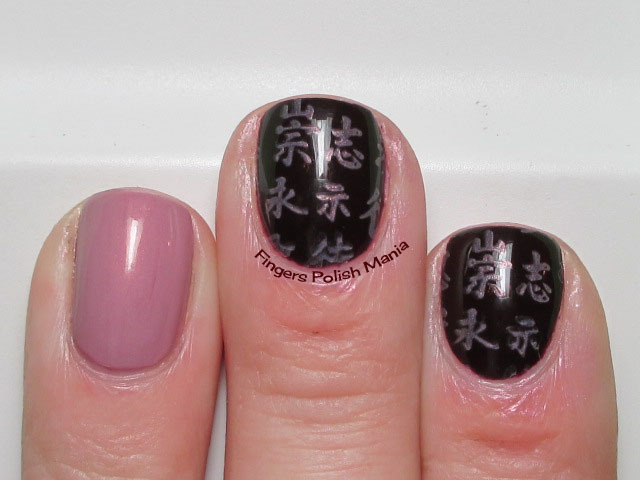 Here is the next step with the accent nail stamped. 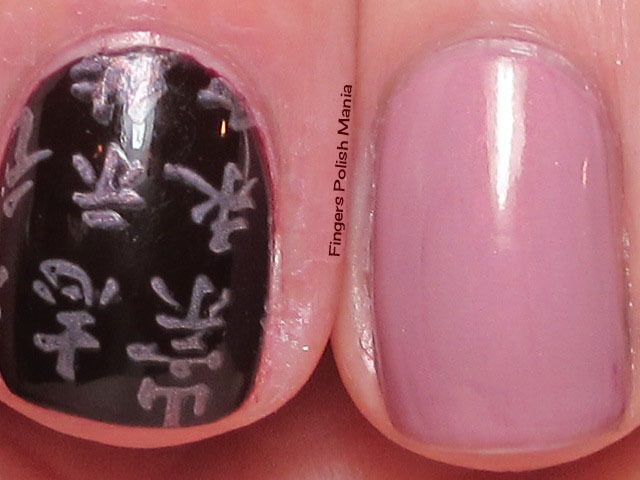 Oh how I love Chinese letters! I had to have this plate just so I could use this design! I finished it off with my funky. Here are the results. I wish I had sun shots to show this off but am still under a thick layer of hurricane clouds. I am in love with this color combination. I have never tried Jessica brand before and just had to have some of their new Spice Collection. I am loving this! 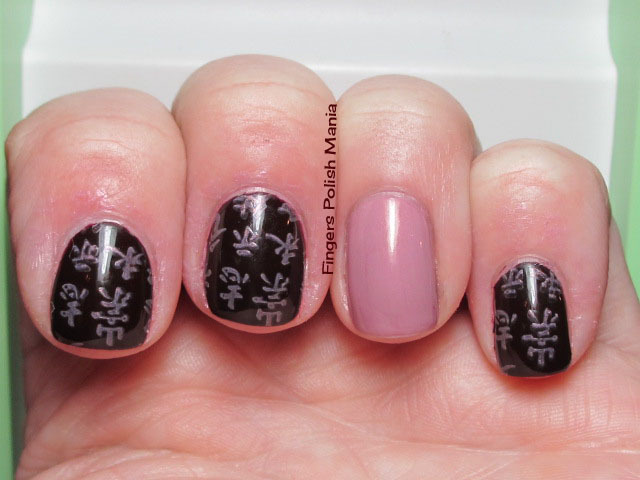 Are you as fascinated as I am with Chinese lettering or Hieroglyphics?